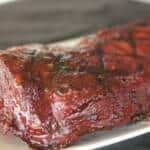 Smoked beef country style ribs, usually from the chuck roast but can be from other parts as well, are cut into strips that are perfectly sized for individual servings just like their pork counterparts. Remove the beef from it’s package and give them a good rinse under cold water. Remove the meat from the marinade (do not rinse). Pour some rub onto the meat and massage it into all sides. Lay the seasoned meat onto a bradley rack or cookie sheet for easy transport out to the smoker. Fill the water pan with water if your smoker has one and have enough smoking wood to last about 2 hours. I use and recommend pecan if you have it. I have been smoking this cut for long enough to know that every location and butcher does them a little different. Interestingly enough, they all tend to look similar but some of them are cut from the chuck roast while others are cut from more tender parts. For this reason, I recommend you monitor the internal temperature of these and check the tenderness once they reach about 135°F which is a good medium rare. If they happen to be tender at 135 then they are ready to eat. If they are still tough as shoe leather, then you likely have some made from the chuck roast and they will need to be cooked to about 185 or so. From my research, it seems that most of them are chuck and will take 4-5 hours of smoky heat to tenderize them but I did want to caution you to make sure. Place the Bradley rack on the smoker grate or place the meat directly on the smoker grate and let the smoking begin. Be sure to use a digital probe meat thermometer to monitor the temperature. When the meat reaches about 135 °F (about 1 to 1.5 hours), check it for tenderness by sticking a toothpick or thermometer probe into it. If it feels tender, remove a piece of the meat and cut/taste it to see where you are as described above in the “Important Note“. If it is done, then all is well. If it is not done, continue to smoke cook the meat until it is tender to your liking. This can take as many as 4-5 hours in some cases. I recommend wrapping them in foil for a couple of hours to help them tenderize more. Once my beef ribs were done cooking in the smoker, I immediately placed them on a very hot grill to get a little sear on the outside and, in my opinion, it was worth it. Brush some of my sauce on the outside and let them cook for about 4 minutes on each side putting them at the 2 o’clock position first for about 2 minutes then at the 10 o’clock position for a couple of minutes to get perfect 90 degree sear marks on the outside. Flip them over and repeat the 2 and 10 position to get the good looking and tasty sear on the other side. Serve the beef CSR ribs immediately. Do I have to marinate the meat? No. The marinating step is completely optional. The ribs will be good even if you don’t but I do highly recommend that you do if possible. If it becomes obvious that the meat will need longer cooking times, how long and when to wrap in foil? When the meat reaches about 160°F is a great time to wrap the meat in foil or optionally, place it in a foil pan covered with foil. Leave the meat wrapped in the foil until it reaches about 185°F or when you determine that it is tender to your liking. Then place the meat on the grill (as described above) for a few minutes to add some great flavor and color to the outside. This is also a great time to brush with some sauce if you so desire. How do you recommend serving the meat? I have been known to just give each person an entire “rib” but I also like to slice it thin and place it on top of a vegetable salad.